Our friend Richard over at the US bike blog Cyclelicious spotted these vintage Cycle Chic shots in the LIFE magazine archives. Brilliant stuff. They were taken by photographer Ralph Morse in Paris, 1945. 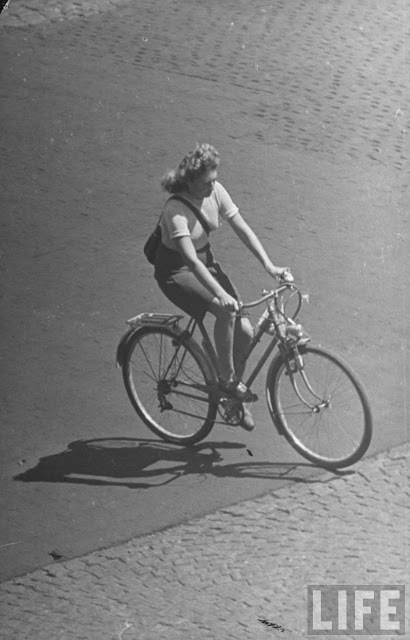 As we all know by now, elegance on bicycles is as old as the bicycle itself. 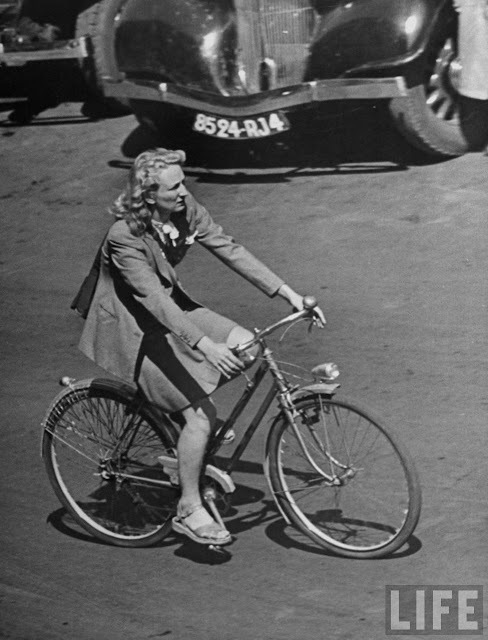 Citizen Cyclists of both sexes have used the bicycle to get around - in style - for more than 125 years. Cycle Chic is just the name (and now trademark) I gave to the genre. It is, however, wonderful to see shots similar to the ones we've been taking for over four years dating from Paris just after the war. Now, the bicycle is back. The world will be a better place. 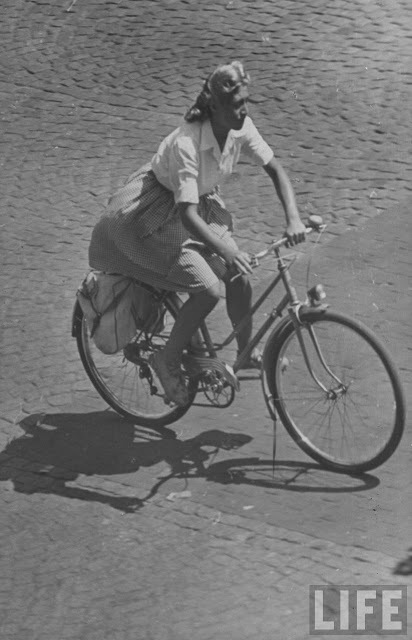 i love it, those big old bikes and summer dresses - but they probably had so much less traffic to contend with in those days! It is true, if we all rode bicycles the world would be a better place! We would be healthier, fitter, happier and richer!! That was during the war, i am hopefull history doesn't repeat itself. The little-known backstory to these: the photographer was reportedly a notorious Parisian bon vivant named "Michel" who was known all around the Isle de France for secretly taking pictures of bike-riding women that he would develop in a tiny closet at the back of his used-postcard stand along the Seine. Truly a man before his time, he started an ill-fated newsletter titled "Les Femmes Cycle Chic de Paris" that featured the pictures interspersed with his pithy commentary. Unfortunately, in that pre-Internet age, there were few takers and the venture failed miserably. Crushed, Michel was reduced to selling his used postcards on weekends and offering tours of the Paris sewers, the only job he could find where he was spared the agony of having to see bike-riding Parisian women doing their Cycle Chic thing along les rues et boulevards de Paris . . .
Helene: Paris looks much the same these days, as our ongoing coverage of Paris Cycle Chic will attest. Just scroll down. ...as long as they don't resurrect those hairstyles! 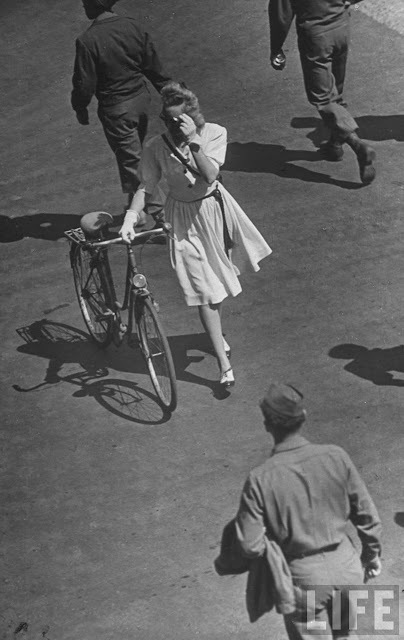 I believe these were shot as part of his series just after VE day, of a Paris returning to normal life. The clothing would seem to bear that out. His photos of millions of Parisians thronging into the streets on Liberation day in August of '44 are far more inspiring to me than the photos of the military parades. 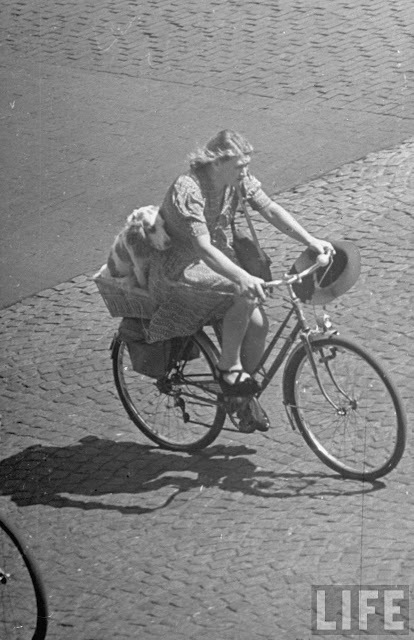 I love the dog in the basket. How come none of them is wearing a helmet? Is it the same lady in pics #1 and #4? Looks that way to me. @Kiwehtin: Each to their own, but I LOVE the hairstyles! Wartime glamour fascinates me (but I'm not sure I'd want to smell it up close! ).